After Bali we jumped on a plane and headed to Australia. Once again I was in complete awe that this was not just a dream destination in the far off “future” but a plausible real experience happening….right now. After a whirlwind journey, a layover in Malaysia with some exceptional red velvet cake in the airport, a trip to duty free for some essentials (two bottles of Absolut) we finally arrived in Sydney. Due to a change in plans Jackie and I were using her parents timeshare and staying at the Marriott in Circular Quay, which is the tourist heart of Sydney with a two minute walk to the Sydney Harbor, Opera House and Sydney Harbor Bridge. Every restaurant, bar or activity we needed was either a short ferry ride away or within walking distance. Within minutes of being in Sydney we realized it was happy hour and we were starving, obviously this needed to be taken care of. It felt so weird to be a country with predominately white people, the signs were in English, and it was so clean I could eat my dinner off the sidewalk. Not to mention, there were so many attractive young men in business suits Jackie and I thought we may have to cut the trip short due to a heart attack. We met a group of people whose office building was close by and they came to this place often for happy hour. They gave us tons of advice about Sydney, Australia, and we enjoyed many laughs and cocktails. We were very grateful for their hospitality and they put a great taste in our mouth for Australia. The next five days in Sydney were a whirlwind of beautiful beaches, incredible food, extremely friendly people, picture perfect waterfront towns and one of the most badass cities I’ve ever encountered. I could seriously go on forever so I’ll stick to the highlights. Walk from Coogee to Bondi Beach – Favorite part of Sydney! This also included the unique art exhibit Sculptures by the Sea. This was one of the most breathtaking 5 kilometers I have ever experienced. There are about 6-7 separate beaches along this ocean front path and each one was unique. Some had huge sand beaches, others were covered with rocks and cliffs. Each one was worth lingering on and as Jackie and I walked we talked about the world, our lives, our travels, just our average heart to hearts except in one of the prettiest locations ever. Tarango Zoo– We got our fix of koala bears, kangaroos, wombats, crazy reptiles and our favorite the giraffes. Not only was this an awesome zoo it also overlooked Sydney Harbor giving the animals one of the best views of the city. Worth the trip. Manly– A little neighborhood a short ferry ride away from the Circular Quay. Perfect water and beaches and you instantly feel like you are a in a suburb you could raise three kids, drive your Mommy Lexus and go to the Farmer’s Market on Sundays. We wandered through the streets picturing our future lives and landed at Little Manly, a picture perfect beach with about 5 other people on it. Watson’s Bay– A ritzy suburb with a similar feel to Manly just add a few zeros to the residents bank account. We enjoyed an awesome brunch at the Dunbar House and soaked up the sunshine, despite the frigid wind. Darling Harbour– Cute area with tons of restaurants, bars, shopping, the aquarium, animal center and various other tourist attractions. Jackie and I decided to post up at a waterfront beer garden and enjoy some of the famous hard cider and specialty beers. Sydney Sky Tower– Sydney’s tallest structure (1,014 feet) with an awesome view of the city. Worth the trip! Wish we could have done the Sky Walk! Pitt Street Mall– Adorable outdoor shopping mall that has everything a 20 something female could possibly desire, including handsome Australian man singing acoustic live music while you shop. Overall, we did an awesome job playing tourist in Sydney. We brought flashpackin’ to a whole new level and I’ll never forget the question, “So you’re backpacking that’s cool…where are you staying?” “The Marriott”….. Shoutout to Pie Face for saving our stomachs and our budgets and all of the very generous Australian fellows who provided us those 12 dollar cocktails that we clearly couldn’t afford. I am awed by the friendly culture, cleanliness and overall badness of Sydney and I can’t wait to visit again. Then our trip led us to the other powerhouse city, Melbourne. We quickly found out from our Aussie friends before we even got to Australian there is a serious rivalry between the two cities. I am not sure how uniform this sentiment is across the Australian population, but in my own personal experience, you either love one or the other. It’s kind of like the New York/LA debate but on steroids with a tinge more animosity. Jackie and I were excited to experience both cities and form our own opinions. The first thing we learned about Melbourne before even stepping foot in the city, there is no R in the name. “Melbun” is how it should be spelled for innocent Americans just trying to fit in. Once we got the pronunciation established, everything else was truly a fantasy land. We had the privilege of staying with our friend Kelsey who moved from our town in Thailand to Melbourne in May. She was a fantastic tour guide and host and our trip wouldn’t have been the same without her. (THANKS KEL). We arrived in Melbourne the night before one of the biggest days of the year: THE MELBOURNE CUP. This is like Australia’s version of the Kentucky Derby. It was one of the coolest days of the trip. We were dressed to the nines along with thousands of others, big hats, crazy fascinators, suspenders and cuff links…way too fancy for two 24 year old American girls backpacking through Bali & Australia. But as we discussed… we are flash-packers. We are simply travelers who carry backpacks not your traditional “backpackers”. 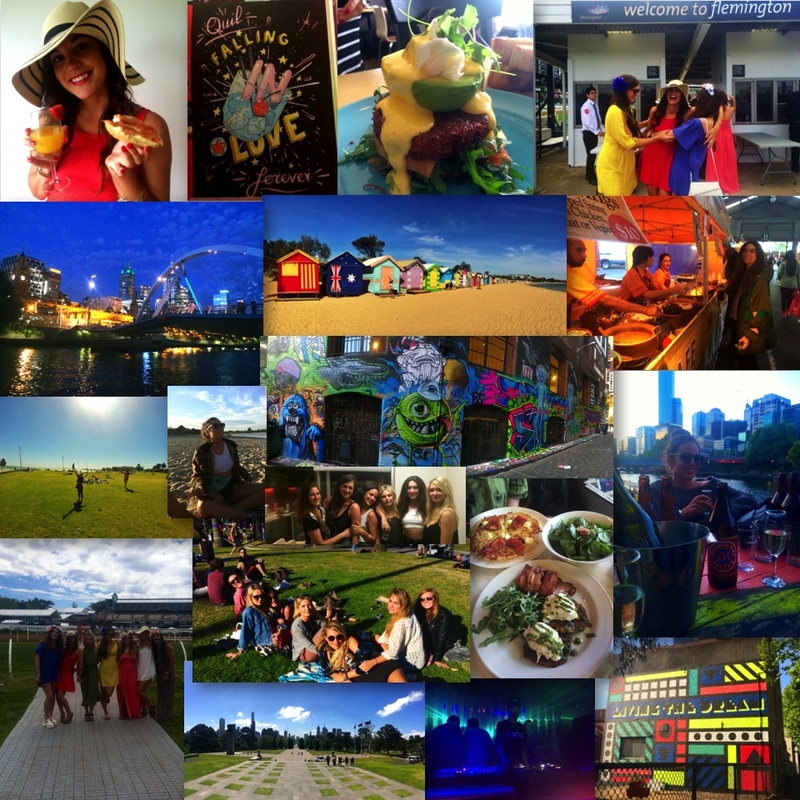 Thanks to Kelsey we got the authentic Melbourne experience which includes A LOT of brunch, live music, crazy funky fashion and incredible street art. Brunch Anywhere & everywhere – The brunch game in Melbourne puts NYC to shame. I’ve never seen so many versions of avocado, salmon and egg dishes in my life. I bow down to Melbourne Brunch. Brighton Beach Bathing Boxes- The first one was built in 1862 and they have been rebuilt/added to many times since then. They have become an iconic part of Melbourne and it is incredible to see the brightly colored houses lined up along the ocean with a view of the city in the background. Hoiser Lane– One of the most famous street art alley ways in Melbourne (there are SO many). Every square inch is covered in street art and Jackie and I got lost wandering around. PonyFish Bar for sunset– Awesome little bar located under the Southgate Pedestrian Bridge in downtown Melbourne. It’s really small but the view and atmosphere is awesome so get there early for happy hour and grab a table. The Shrine of Remembrance– Huge monument to commemorate the Australian soldiers lost in the First World War. Gorgeous view of the city and beautiful landscaping that Jackie and I may or may not have accidently took a nap in. St. Kilda Sunday Session – In America we refer to them as “Sunday Fundays” but Australians deemed them Sunday Sessions, which I think I kinda like. After my first Melbourne Sunday Session, I have to say I’m converted. We spent the day in the park overlooking the beach, laying in the sunshine drinking wine, watching people slack line, play music and basically any other circus activity you can think of. It.was.awesome. It reminded me of Central Park on a nice summer day…except they can do it about 6 months a year. It is so bittersweet to read the last entry of this chapter of your amazing blog. Each post has been like a little pearl forming a necklace to live in your memory and heart. It will always be in mine and all your readers.You have made every country come alive through your exceptional words and pictures. It also makes you want to appreciate every moment as a mini journey to be absorbed and cherished .. No matter how small. Dad and I are so happy to have you home with us now as you refuel your soul for your next journey . We love you to the moon and back and are so proud of you as an amazing writer but most of all.. A one of a kind ,loving, caring student of the world. Bravo, Melinda Donovan Bell. Nani would be so proud of your unfettered encouragement. 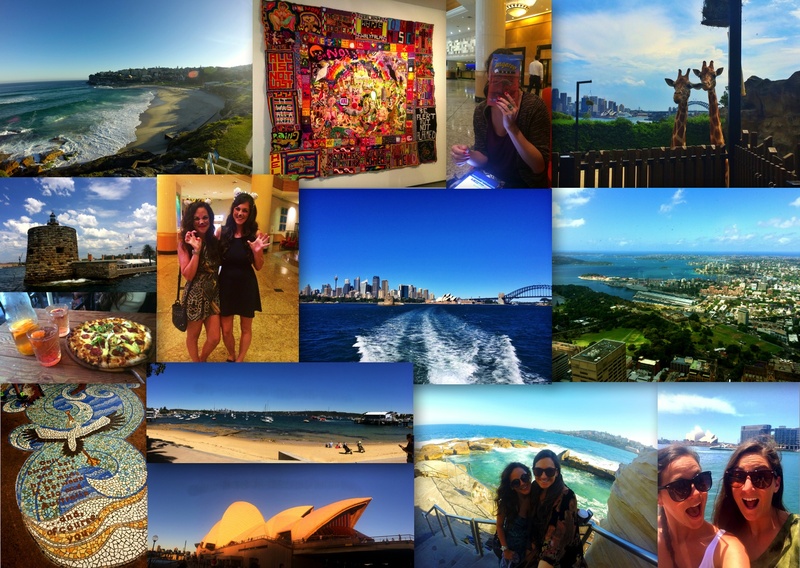 Great travelogue of advice for young travelers to Australia. Happy to say Susannah loved it so much she plans to return very soon… but sorry to say she loved it so much because we will miss her again if she decides on another one year adventure more than 10,000 miles away from home.